How to use Maya 3d to storytell and clarify complex subjects. Animated Information Graphics: An Introduction to Maya 3D, is a Skillshare class developed by the NY Times Senior Graphics Editor Graham Roberts about creating animated infographics. The free online course offers the fundamentals of Autodesk Maya 3D, as well as an introduction to modeling, rendering, animating, and visualizing information using the power of 3-dimensional design. Roberts basically provided tips for getting started on the animation software, and let us know that Maya isn’t that of a “monster” application as many people thought it was. He has been using Maya 3D to create an array of information graphics design projects for The New York Times, and he related these skills to the kind of work produced in the journalism industry and beyond. Through its project guide, Roberts assigns the students to create a 3D animation or 3D data visualization that includes: familiarizing yourself with Maya; basic modeling using the different tools; practicing basic animation; creating a set of renderings; and familiarizing yourself with code in Maya. In case you’re wondering why Graham shares the work that he’s doing, we’ve also been afforded a Q&A where we’re given the answer to this question and some advice for aspiring Information Graphics designers. I’ve seen a lot of Maya classes, a lot of journalism classes, and a lot of data visualization classes. But I wasn’t seeing any classes that brought these ideas together, and demonstrated Maya’s value to journalists. Since I’ve found Maya to be a great tool for journalism, I wanted to create a class in Maya specifically targeted to journalists, and anyone interested in visual storytelling. Something that would cater to the kind of skills visual journalists would care about. 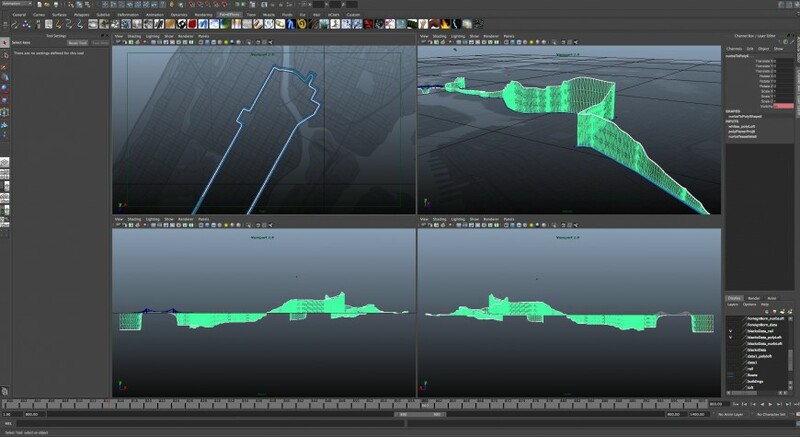 Maya is an incredibly powerful tool, but can also be intimidating to people who have had no experience with 3D. I wanted to change that by teaching Maya from my perspective and experience as a journalist. I think anyone who wants to tap into the visual power of Maya will find that by the end of my class they will already be able to create a wide variety of imagery and have a strong foundation to build upon. If you could give an up-and-coming journalistic graphic artist/information designer 3 pieces of advice, what would they be? We also recommend that you take a look at Graham’s first Skillshare class, Animated Information Graphics: using data and motion to reveal the story, which gives various examples of how to use data and motion to present fascinating visual stories.